A good many of my clients are caterers. We provide the tablecloths for their events and parties. 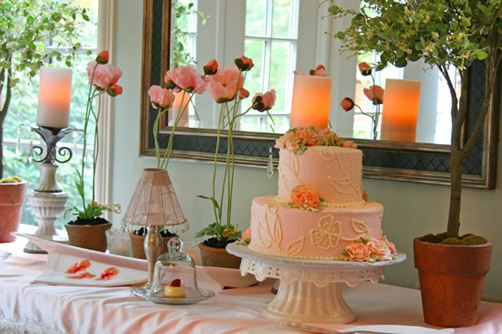 Although all caterers provide food, only the really good ones also provide ambiance. This is also true even if the party is at your house. 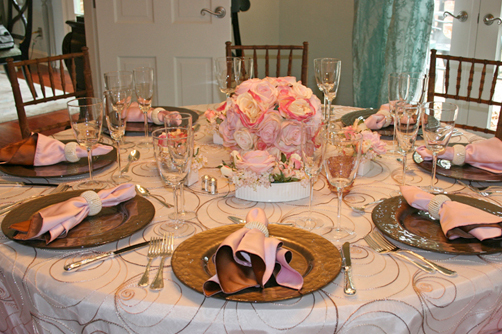 Flowers, tablecloths and artful set up are key to making your party beautiful and your guests feel special. As you know, here at the faux farm we need to hire a caterer unless we are serving pizza. Even that is sort of like being catered since I am still not actually doing the cooking. On the other hand, I do know how to set a table, make flower arrangements and spread the good cheer around. A beautifully set table will enhance the flavor of any meal. Well, with the possible exception of my cooking, but then I razzle dazzle them with table finery so that they almost forget to eat. The next time you are having a party at home, remember to use a tablecloth. It makes you and your guests feel special. 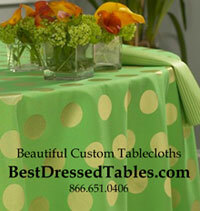 Check out www.bestdressedtables.com if you need a custom cloth in a particular size or color. If you feel pressed for time because you are cooking then set your table a few days ahead of time. Setting the table should be the fun part so do it early when you have the time to enjoy it and don’t feel rushed. Then gently put a sheet over the set table to keep it dust free. If you have fine crystal stemware, you may want to wait to put them out on the day of the party so that the sheet doesn’t tip them over. On the party day carefully remove the sheet, add your flowers and you are done. Set up a side bar for drinks and a buffet area for dessert. Enhance them with flowers and a tablecloth. 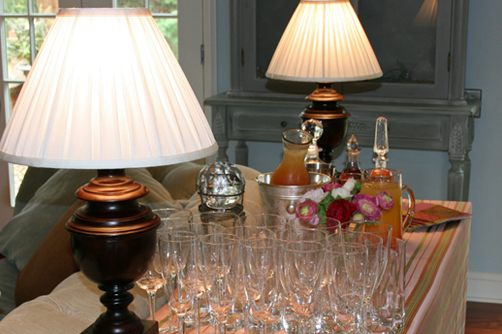 Candles always set a warm and elegant tone to an evening event. A great candle resource is www.candleimpressions.com. They sell wax pillars candles that look very realistic but are actually battery operated. They take two c batteries and will run about 350 before they need a battery change. They also come with a version that has a timer in it so that for everyday use the candles will come on and off at a preset time. I have never been a big candle person because although I love the coziness of the candles, the fear of fire has always overruled the cozy factor. They are great outside, as they won’t blow out. They are great if you have kids, as that is my other fear – fire and children. I clearly have fire issues but then my house did burn down (electrical) but fire is fire to me. Besides, they wouldn’t be faux farm candles if they were actually real! So go set the table, invite friends over and have a great time.